Off the heels of a successful partnership with CVA, a true leader in the muzzleloading industry, Konus has a line of riflescopes with a ballistic reticle that is especially designed for muzzleloaders. The Konuspro-275 models help to remove the guesswork out of shooting, since their reticle is featuring several aiming points that are calibrated from 75 to 275 yards and coincide with the most popular black powder loads. Lateral hash marks have also been added to compensate for wind. 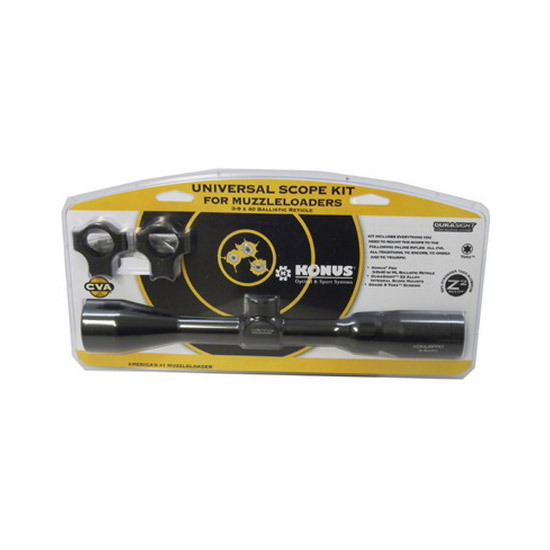 These riflescopes consequentially provide an undeniable advantage in terms of improved accuracy and better performance. - ADJ. range M100M - IN100YDS: 1,3m/52.4"
- Mounting length mm/inches: 142MM./5.6"